Microstock photography site Fotolia has taken its first outside round of investment since it was founded in 2005 and it is a doozy. The company isn’t talking about it, but an exceptionally good source with knowledge of the deal confirms that private equity firm TA Associates has invested between $50 million and $100 million in Fotolia . In comparison, rival iStockPhoto was acquired for $50 million by Getty Images three years ago. There are some rumors going around in venture circles that Fotolia got sold outright for $150 million. Our source, however, emphasizes that the company was not sold. Instead, after competitive bidding from more traditional venture firms, TA Associates came in with a massive injection of capital. Up until now, Fotolia has been self-funded by French entrepreneurs Oleg Tscheltzoff, Thibaud Elziere, and some silent partners. The company is officially headquartered in New York City, but everyone still works from home. The company has been on a roll lately. It reached one million registered users and five million images for sale in February, introduced microstock video in April, hired an iStockPhoto co-founder in May, and just yesterday launched a royalty-free photo site called PhotoXpress. 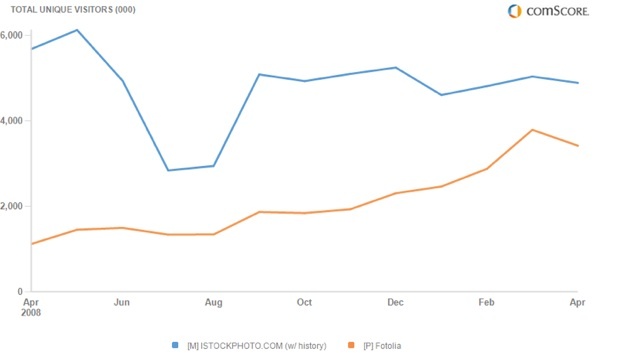 Fotolia is smaller than iStockPhoto, but it has been going through a recent spurt of growth, while iStockPhoto seems to be stagnating. For example, unique visitors to Fotolia have tripled in the last twelve months to 3.4 million worldwide, according to comScore. Meanwhile, iStockphoto’s uniques are down 14 percent to 5.9 million (see chart below). Fotolia is being pretty aggressive in undercutting iStockPhoto’s already low microstock prices, and the new PhotoXpress site is even more disruptive. Forget about selling images and illustrations for $1 to $10 a pop. It offers 10 free images a day. It is hard to see how this translates into huge revenues for Fotolia, but obviously it has big ambitions. Now it has the cash to really shake up the market.